MUMBAI, October 22, 2018 /PRNewswire/ — As part of Community Social Responsibility, Rustomjee in association with CREDAI Clean City Movement and BMC set up Organic Waste Composters for Solid Waste Management for residents near Guru Nanak Park, Bandra West. Unlike all Municipal Gardens, Guru Nanak Park also had some reserved space for ‘Compost Pit’, which is utilized for setting-up CCCM’s’ Bio-Digester Bins. CCCM is recognized for treating bio-degradable wet waste and converting it into organic manure using Aerobic Microbial system . With this project, approx. 2.5 tons of wet waste will not go to the dumping ground. Implementation of the system was done on Saturday, 20th October, 2018 in a formal inaugural programme in presence of Asst. Commissioner, MCGM – Mr. Sharad Ughade and Corporator Ms. Swapna Mhatre and Mr. Boman Irani, CMD, Rustomjee and Vice President-CREDAI-National and CREDAI-MCHI. 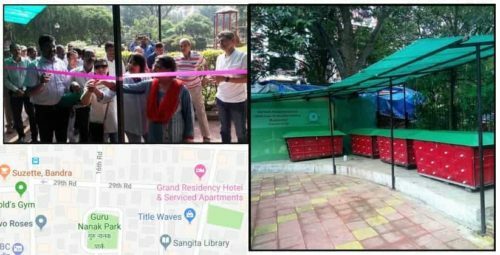 Mr. Ughade obliged the ladies from nearby buildings to cut the ribbon as they will be actually participating in #sourcelevelsegregation initiative. On this occasion, Mr Sharad Ughade spoke to the residents about the need of Decentralised Solid Waste Management and appreciated ideal solution organic composters conceptualized by CREDAI. He wished to replicate this model in other BMC Parks. According to a Planning Commission report on Waste Management, 377 million people living in 7,935 urban centres generate 62 million tons of Municipal Solid Waste per year, which is based on an average per capita generation of 450gm per person per day. Urban local bodies spend around INR 500 to INR 1,500 on per metric ton on solid waste management, out of which 60% to 70% is usually spent on collection, and 20% to 30% on transportation. Indian infrastructure sector has received a boost with the government’s focus on smart cities and development. Both commercial and residential segments have witnessed a growth across the country. With a growing number of high-rise buildings, commercial business parks and industrial complexes being developed, there is an increase in solid waste output. This calls for an efficient waste management system since an inefficient one has led to all types of pollution. CREDAI has joined the Hon’ble Prime Minister in his ‘ Swachh Bharat Mission’. CREDAI Clean City Movement is supporting ‘ Swachh Bharat Mission’. CREDAI ensures that the buildings constructed by CREDAI members will not be source of pollution and they will maintain the city clean. This initiative will also speed up our growth towards building ‘Smart Cities’ as per the Prime Minister’s vision to ‘Build 100 Smart Cities’. CREDAI is dedicated to create model cities and make all buildings ‘Self-sufficient’ for Solid Waste Management. In this year, 10 million residences will join hands together for CREDAI Clean City Movement and CREDAI will give leadership and facilities. Rustomjee has carved a niche for itself in the ever-growing real estate sector, with a portfolio that includes 14.32 million square feet of completed projects; 12 million square feet of ongoing development and another 28 million square feet of planned development in the pipeline, spanning across the best locations of Mumbai Metropolitan Region (MMR). Their portfolio currently includes two very large townships, residential spaces, office complexes, retail developments, spaces for healthcare and education spread across BKC Annex, Khar, Off Juhu Circle, Kandivali, Borivali, Virar and Thane. Rustomjee lays emphasis on adding value to the lives of their homeowners through their core business, their CSR initiatives and philanthropy. They have strived to ensure that every blueprint includes child-friendly spaces for parks, playgrounds, and learning rooms and thereby encouraging families to spend quality time.